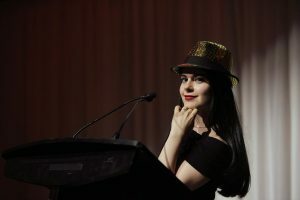 TORONTO, May 22, 2015 – Editorial cartoonist Bruce MacKinnon has been named the first-ever National Newspaper Awards Journalist of the Year, chosen from among 22 NNA winners announced Friday night at a gala dinner in Toronto. The Globe and Mail took top honours at the ceremony, with five awards. Six other organizations won two awards each: the Canadian Press, the Hamilton Spectator, the Moncton Times & Transcript, the Ottawa Citizen, the Toronto Star and the Vancouver Sun. The Edmonton Journal, the Halifax Chronicle Herald, the National Post, the Toronto Sun and the Winnipeg Free Press also won awards, in a year that recognized journalistic excellence from coast to coast. MacKinnon, of the Halifax Chronicle Herald, won in Editorial Cartooning for a portfolio that included a powerful image of a Canadian veteran stepping down from the National War Memorial to claim the fallen body of Corporal Nathan Cirillo. The cartoon became the iconic image representing the shooting on Parliament Hill last October, after it was picked up and published around the world. It was MacKinnon’s fourth NNA win for Editorial Cartooning; he has had eight nominations in the category. Published the day after the fatal shooting of Cpl. Nathan Cirillo, a reservist who was guarding the National War Monument outside the Parliament buildings in Ottawa. Bruce MacKinnon — The Chronicle Herald, Halifax, N.S. This is the first year the National Newspaper Awards have designated a Journalist of the Year. MacKinnon was chosen from among the 22 category winners, with the decision made by a panel of previous NNA laureates. All category winners received cheques for $1,000 and a certificate of award. Other finalists received citations of merit. The Journalist of the Year is awarded $2,500. The National Newspaper Awards are open to daily newspapers, news agencies and online news sites approved for entry by the NNA Board of Governors. Seventy-one finalists were nominated in the 22 categories, selected from 1,297 entries published in 2014. Of 63 newspapers and online news sites to submit entries, 24 organizations had nominations in the 66th year of the prestigious awards.